A group of nine enthusiastic Americans came to Thailand to learn about Traditional Thai massage, partake in a village homestay and enjoy other local activities like spear fishing with the Moken people on a white sandy beach. 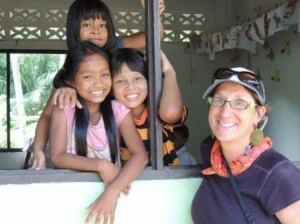 A truly diverse and integrated experience took place over their three weeks in Thailand! The group started by doing a village homestay at Ban Talae Nok village in Ranong. Here, they were able to enjoy fun activities like, creating beautiful batik, crafting roofs out of nipa palm, making a yummy Thai snack and making soap from natural ingredients…just to name a few!!! On top of these great activities, the group was able to eat delicious Thai food while talking with their homestay families and learning the ins and outs of daily life in Thailand. After the village experience, the group was split so that half could learn traditional Thai massage while the others explored the local area. The Thai massage group was able to have a hands on, interactive training from a very knowledgeable masseur in Kuraburi. The relaxed learning environment allowed for cross cultural exchange to take place from both sides. The group was very happy and felt like they learned a lot and were all excited to share the knowledge they learned during the training with friends and colleagues back home. The second group went on many explorations throughout the week. They started by peacefully making their way to a forest temple where they learned the art of meditation from a monk. Next, they went on a twenty minute interpretive hike through a local rubber tree plantation and garden that opened up to a natural waterfall. The group was able to cool their minds and spirits in the fresh spring water. The scent of grilled chicken over an open fire filled everybody’s noses as they watched their Thai hosts create a meal using the natural materials surrounding them, even the cups and plates were made out of bamboo! 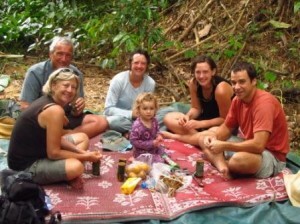 The meal was enjoyed in the beautiful forest listening to the sounds of nature. It was a true testament to living simply and using resourcefulness to live a full life! A service project was also done at a local Burmese Learning Center. The group helped the kids make a vegetable garden behind the center so that they can become more self sustainable when cooking meals at lunchtime. It is a special thing to see people from different places, with different languages coming together for a single purpose….to enjoy each others company, laugh and play games! Another village the group experienced was Ta Pae Yoi on Koh Prathong island, about an hour boat ride from the mainland that offers pristine views of the mangrove forests. The group did everything from eating delicious food at a temple ceremony to hopping on a tractor and riding through a savanna that opened to a beautiful beach. The day ended relaxing at a house stilted over the water facing the mainland of rolling mountains mystically covered with low clouds. The trip ended with a trip to Koh Surin. Here, the group was able to interact and learn from the Moken people by taking a walk through the jungle where they learned about medicinal plants, spear fished on the ocean shore, and rowed a traditional Moken wooden boat! The other days were filled with snorkeling and soaking in the views that nature has to offer if you just look and listen! Their journey was full of laughter, learning and truly understanding Thailand so that it can be respected and preserved for the beauty it and its people has to offer!